Embroidery and monogramming are two of the most satisfying things you can do with a sewing machine! You can add classy labels to your personal linens, make a decorative border for your favorite tablecloth, or even create a decorative piece of embroidery to hang on your wall. Whatever projects you have in mind, embroidery and monogramming require something special in a sewing machine. You need something built specifically for embroidery and monogramming, or a premium all-purpose model that can do these fancier tasks as well as everyday projects. In this guide, we’ll show you a few models that we love for this kind of finish work. We’ve written in-depth reviews for each recommendation, and we’ve topped it all off with a buying guide to help you choose between them! 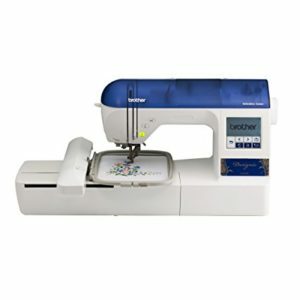 This Brother Project Runway model is a super affordable choice for anyone who wants to do embroidery and monogramming. It’s not a true embroidery machine, but it has loads of decorative stitches onboard and a full alphabet/number set for you to monogram. We think this is a great budget machine for folks who want to do fancier work. It’s accessible enough for a beginner, but versatile enough for a more experienced needleworker. The Brother has a simple, easy-to-use computer system which offers lots of versatility without much advance training. New embroiderers will love the automatic features, since they allow one to skip the learning curve almost entirely. At the same time, there are so many features on this one that experienced people on a budget should get a lot out of it! It has 100 built in stitches, which gives you lots of room to branch out and try different things. With the adjustments, you get up to 140 different stitch functions. That’s a lot of variety for any machine, especially one under $200! And while this might not be a true embroidery machine, you still have dozens of decorative and “heirloom” stitch patterns to mix and match. There’s a full alphabet, and a set of numbers too! This is one of the least expensive models you can find with a complete monogramming bank onboard. It allows you to do anything basic. There aren’t any capital letters or additional fonts, but if you’re just looking for the basics, this will do them handily! The Project Runway also has 8 different styles of one-step buttonholes to choose from. That’s as many as most $500 machines have, if not more. You can browse through all your stitch options using the flip-down chart built into the front of the machine. Then, you use the simple tab buttons to key in each digit to get to your stitch. It’s simple and straightforward, which we always appreciate! All the stitches are adjustable in both width and length. So, if you find a pattern you like that’s just slightly too big for your piece, you can tweak it to suit the dimensions you’re working with. The computer will helpfully tell you which foot to use for each stitch! That’s a feature you don’t usually see on machines as inexpensive as this one. It’s perfect for newcomers, and convenient for old hands. It has a simplified, easy-access bobbin compartment. The Brother follows the now-common drop-in format, and it’s jam-resistant. We think it works wonderfully. The winding system is extremely easy, too. It has a nice bright worklight. The bulb is an LED, so it puts out a lot of lumens. Compared to older incandescent bulbs, it also lasts a lot longer. It’s perfect for seeing fine detail while you work, even at night. There’s also a wide extension table that’s intended for quilting. We think it’s slightly small for quilts, but it’s a nice way to spread out decorative pieces and get a sense of the whole effect as you work! It threads automatically. There’s a lever feature which helps accomplish that trickiest part of sewing for you! There are also some automatic features around the needle position. You can set the system to raise or lower the needle automatically at the end of a stitch. You can also pre-set your own preferred position for the raised needle, and the machine will go back to that setting each time. The Brother is no slug! It’s fast, with a top speed of 850 stitches per minute. You can control the speed precisely via a sliding switch. There’s also a push-button system for stopping and starting. It’s good for longer stitches where keeping your foot down constantly isn’t ergonomic. That’s not usually an issue with embroidery, but if you’re adding a decorative border to something like a tablecloth, it can definitely come in handy. Unlike a lot of other Brother’s, it has manual thread tensioning. With most other models from the brand, especially the cheap ones, the tensioning mechanisms are all automatic. They work well most of the time, but you can’t tweak them if they go haywire. That means a potentially expensive trip to the dealer for repairs. With the Project Runway, you can fix the tension yourself! That makes it much easier to problem-solve, especially if you’re one of the many people who don’t have a dealer/authorized repair shop nearby. It does well on a wide range of materials. The presser feet adjust their tension automatically, which makes transitioning along layered pieces a piece of cake. It’s powerful enough for denim and upholstery materials that make other machines at this price struggle. The Project Runway has a built-in free arm feature. You can use it for cylindrical pieces, or any other projects that demand maneuverability. You can also drop the feed dogs for free motion quilting and embroidery-style stitches. One of our favorite features is the automatic thread cutting feature onboard. When you’re doing decorative work, you tend to use lots of different threads in order to have as few connecting lines as possible. This one makes that a cinch. You don’t have to keep stopping and reaching for your shears. All your accessories can be stored in the arm! It weighs less than 10 pounds. For a fully-featured machine like this, that’s incredibly light. Beginners will enjoy being able to carry this to class, and social quilters can take it to their groups just as easily. Conveniently, you also get a hard case included in the box. While it’s very inexpensive for an embroidery machine, it’s pricier than other entry-level options. We think this is the least you can pay for something with enough decorative and alphanumeric stitches to really call an “embroidery” machine. It’s not a true embroidery machine, but it has so many decorative stitch options that many people should find it suitable. As with a lot of the inexpensive Brother’s, quality control isn’t particularly good on this Project Runway. Tensioning issues are common, so you may have to spend some time with the manual troubleshooting out of the box. The occasional unit does also ship with some more serious issues, but it’s quite rare. Some buyers have reported being unhappy with threads bunching up. Some other reviewers thought the Brother jams relatively easily on stretchy fabrics. In our experience, the sort of problems most customer reviewers described are due to incorrect threading or misaligned tension. We think that as long as you take the time to read the manual and learn how to tweak the tension and threading properly, you’ll be good as gold. It doesn’t have a stellar reliability record, though it is better than the competition. Computer issues are the usual culprit. It’s also made almost entirely from plastic. The automatic threader is the most delicate part. You can’t expect this one to perform like a more expensive machine, even though it has many of the same features. While we’re confident that this one will last longer than other decorative models for the money, we absolutely recommend buying additional warranty coverage from a third party at the checkout. This Brother goes for about twice the price of the Project Runway. It’s a similar format–a computerized sewing machine with lots of built-in features. This one’s a true embroidery machine through and through, though! We think it’s easy to see why the SE400 is the best-selling embroidery machine on the market these days. It’s specifically designed for 4”x4” embroidery, and it has 70 embroidery designs built in. Since you can connect it to a computer, you also have infinite room to create and add your own designs. Best of all is the price– for about $300, you get a full-featured embroidery machine that can make a capable primary machine for many users! It has a much nicer computer than the Project Runway. This one has a back-lit, touch-screen display which allows you to access stitches and patterns much more quickly than keying them in slowly on the Project Runway. The SE400’s computer might be a bit more elaborate, but having graphic buttons on the touchscreen makes it feel much more intuitive. It’ll also tell you helpful things like which foot to use, or whether your thread is about to run out! They’re convenient for new and old stitchers alike. The touchscreen is an easy way to access built-in tutorials and your settings as well. There are 67 unique sewing stitches built in, and 98 stitch functions when adjustments are included. There are also 70 built-in embroidery designs, and 120 frame pattern combinations! So, right out of the box, you can get started with a wide range of patterns and decorative designs for your projects. Like the Project Runway, the SE400 has monogramming features pre-programmed. In fact, it quintuples your options with a full 5 different lettering fonts. You can adjust the font sizes on the SE400 too, which isn’t an option on the Project Runway. Small, medium, and large options are available. It has an enlarged 4”x4” embroidery workspace. That fits frames perfectly, and you even get one in the box! It’s one of the features (like the sliding frame holder) which makes this a real embroidery machine as opposed to a machine with some embroidery features (like the Project Runway). It also has a smart one-step buttonhole feature! The machine will automatically adjust the proportions of the buttonhole to match your button, without you having to do any manual programming! The 7-point feed dogs are smoother and more adaptive than the feed dogs on the Project Runway. They’re even better at handling different textures, thicknesses, and types of material. Like the Project Runway, the SE400 has an automatic needle-threader and one-touch automatic thread-cutting. You can simply push a button to cut both the top and bottom bobbin threads. It doesn’t get much easier than that, especially on an affordable machine! It has a similar LED worklight, drop-in bobbin configuration, and overall layout to the Project Runway. The SE400 has the same sliding speed adjustment switch, and it works with a push-button for stopping and starting in addition to the foot pedal. As with the Project Runway, the SE400 has a free arm and droppable feed dogs to give you more maneuverability. Unlike the Project Runway, the SE400 is designed to be expandable. It’s compatible with most computers. That means you can easily download embroidery patterns from the web, and then stitch them with your own machine! There are lots of free ones available, so most people don’t need to worry about paying anything extra for the designs. The Brother SE400 uses the standard .pes file format, so you can get your patterns from lots of places beside the paid Brother site. Moving designs over is incredibly easy, and you don’t even need any software to do it. You just copy and paste files to the drive. It works on Mac or PC. Being able to connect the SE400 to your computer also makes software updates easy. You don’t need to bring it to a service center to get it up to date! It’s nearly as light as the Project Runway, even if the enlarged embroidery area makes it less compact. The SE400 weighs right around 10 pounds. It’s covered by the same 25-year warranty and lifetime phone support as the Project Runway. We’re especially impressed by the manual and DVD that come with this one. They’re extremely thorough, and if you take the time to go through both before you start working, you can easily avoid many of the common user-related issues that can happen with a machine like this. You can get it in a bundle with a 50-piece set of embroidery accessories and thread. We think that’s the best way to go, since most people will need to buy a lot of the same accessories to start embroidering. You can cut down on the startup costs by going with the bundle! It doesn’t have as many stitches onboard as the Project Runway, even though it does have more functions overall. This one is definitely aimed more in the embroidery direction than at general stitchery. The embroidery area is nicely standardized for 4”x4” hoops, but it is rather small compared to many larger hoops. Brother make a reposition-able hoop for this machine that’s a must-have if you want to do larger projects, but you’ll have to buy it separately. Otherwise, you’re looking at a machine with a larger embroidery area built in. Lemons aren’t unheard of with this model, even though it’s the next price tier up from the Project Runway. Brother’s quality control is by far the company’s worst flaw. Again, make sure to inspect and test yours thoroughly before your return window closes. The SE400 has a good reliability record, but not a flawless one. As with any machine with lots of plastic parts, something could eventually snap or crack if you’re not careful. In our analysis, most of the issues previous buyers have cited are due to user error. Most, but not all. You can’t use cheaper thread. It can throw off the tension, cause bunching, and many other common mishaps. You can’t use different bobbins than the ones that are made for the machine, and you can never use metal ones–even if they seem like they work at first. That can destroy the compartment and lead to costly repairs. You need to know how to tweak the tension. Tension is the #1 thing that causes poor results on any machine, and many folks who have said they’d run into trouble with this one didn’t seem to have a firm grasp of it. It’s very important to read the manual thoroughly when you work with a machine that has this many features. Otherwise, you could end up frustrated or with broken parts. Overall, we think this is a great machine for what it’s intended to do: lighter finish work. This is not a heavy workhorse model. This could be a primary machine for people who don’t do big projects regularly or work with lots of thick and heavy materials. If you do a lot of quilting, denim work, or other intensive tasks as well as embroidery/monogramming, the best approach is to own one of these for finish work, and also a more simplified but more rugged Janome for workhorse tasks. Be sure to go with an extra warranty if you can. Brother’s warranty won’t cover the costs of shipping your machine to the company. So, we think it’s better to deal with something like a Square Trade policy instead. The Brother Designio is our top pick for embroidery and monogramming. It takes the platform of the SE400 and pushes it a bit further! The Design has accommodations for all common embroidery hoop sizes, and it has many times the built-in patterns that the SE400 has. With 136 different embroidery designs onboard and computer compatibility, you can do virtually any embroidery project easily with this machine. It has all the automatic and convenient features that you’d get on the cheaper Brother’s and much more! It’s the most versatile of the three when it comes to onboard options! This model has 136 embroidery designs preprogrammed from the factory. There are also 6 unique lettering fonts for monogramming projects, and 120 different frame combinations for you to work with. You can easily edit all the preset patterns right on the machine, so that you can scale them or crop to your needs! Most importantly of all, this one gives you the most workspace for embroidery. It has a dedicated 5”x7” area, which gives you a lot better range than the SE400. You get three different frames in the box. There’s a 4”x4” like you get with the SE400, a smaller 2.5”x1” frame for little pieces, and a 5”x7” frame that uses all the space the machine will allow for. There are preset designs and scaling options for all three sizes. It has a large touch-screen display, like the SE400. You can use it to select stitches, browse through patterns, and make adjustments to stitches. The Designio’s computer also allows you to use a memory bank to store your custom designs, or save preset patterns for later! Just like the SE400, the Designio connects easily to your computer. You can use the USB connection to download software updates, as well as to add extra embroidery patterns to the machine. It uses the standard .pes file type, and has plenty of room for your additional patterns onboard. The Brother works well with both PCs and Macs, since you can simply drag and drop files. You can also use a thumb drive with this model. It has its own USB port built in, so you can simply keep all your designs on a drive and have easy access to your library! You don’t even need to get out your laptop to import designs onto your machine. This value package deal that we’re recommending also has an extra 2 embroidery hoops, and another 200 designs for you to use. They’re on a CD, so you’ll need a computer to move them over to the sewing machine. However, it does add rather a lot more bang for your buck! The Designio has every automatic convenience offered by the cheaper Brother’s onboard. 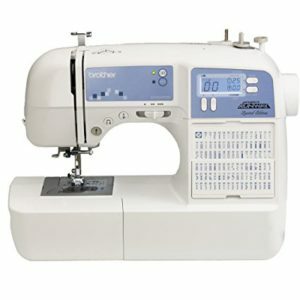 It has an automatic needle threader, a jam-resistant, drop-in bobbin loader, and push-button stitch control. It has the best work-light of the three. As with the other Brother’s the Designio has a bright LED bulb, and it gives you both excellent coverage and fine detail. As with the other two Brother’s, this one is covered by a 25-year warranty, and free phone support for the life of the machine. It has a thorough, helpful manual and DVD in the box as well, so you can get to know your machine quickly. This is an embroidery-only machine. It’s incredibly good at embroidery and monogramming, but this is not an all-purpose sewing machine. That’s a key difference from our other two recommendations! It’s the best for embroidery, but won’t help you with your other tasks. It’s expensive, and still more expensive when you consider that you’ll definitely need another machine to do your other sewing projects. You’d hope that the more expensive Brother’s like this one would have better quality control, but no dice. Most people still end up with perfectly good machines, but some Designio’s turn out to be lemons either out of the box or within the first few uses. It’s also mostly plastic, like our other recommendations. While the build quality on those machines can be explained mainly by the price, the Designio is a fairly expensive machine. It should really feel sturdier. We wouldn’t recommend it if we didn’t think you’d get a good working life out of it. However, we still recommend going with an extra warranty at the checkout if you can get one. The Janome has an absolutely enormous embroidery space, even larger than the Designio’s. You’ll have just under 8 square inches to work with. There’s also a generous table extension to give you lots of room for spreading out a workpiece. It has 160 built-in embroidery designs, 6 distinct fonts, and an extremely nimble stitch speed! Working with the Memory Craft’s touchscreen is a breeze. It allows you to manipulate any design to a virtually infinite degree, and it’s not clunky like cheaper interfaces. You can import additional designs via a USB port, or design your own stitches right on the machine to be saved for the future. It comes with a hard case, accessory set, and pretty much everything you need to get sewing, embroidering, and monogramming. We haven’t recommended the Memory Craft in our main picks because it’s cost-prohibitive for most buyers. If you’re super passionate or professional, though, and can afford the cost, it’s a worthy workstation! You’ve probably noticed by now the we’ve recommended all Brother models for our main recommendations. That’s because we’ve found that Brother’s lineup offer the most dedicated embroidery features and monogramming options. Especially when you consider how affordable these are compared to other brands, they’re the shoo-in to recommend. We should clarify that there are certainly great Janome’s and Juki’s for embroidery/monogramming. However, for a fully decked-out machine, you’d pay vastly more than you would for something from Brother. That’s why we suggest the Memory Craft only as a See Also pick. Given than the Janome and Juki embroidery options cost several thousand dollars, we’d recommend sticking with one of the Brother’s unless you’re a pro or super dedicated. We think that if your primary interest is in finish work, or if you’re looking for a secondary machine just for embroidery and monogramming, these models are the smartest choices. However, if you’re set on having a workhorse model that’s a fully-equipped embroidery machine as well, you might look at Janome’s Memory Craft line. Which of our recommendations is the best choice for you? The Brother Project Runway is the clear choice for anyone who wants to do basic embroidery and monogramming on a budget. Its versatility as an all-purpose machine adds to its value factor. It has a full alphabet onboard, and enough decorative stitches to create finish work. The Project Runway might not be the most rugged machine on the market, but it will last for years if you’re reasonably careful with it and follow the manual closely. However, it’s not a true embroidery machine. You’re also limited to one font for monogramming. 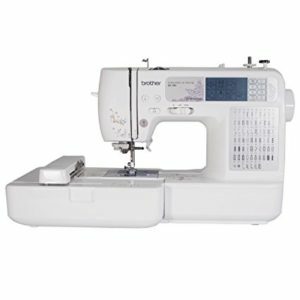 If you want an all-purpose sewing machine with more embroidery and monogramming functions, you should look at the SE400. The Brother SE400 gives you a lot more embroidery functions, without losing value as an all-purpose sewing machine. It’s not as rugged as a lot of other machines for this price, but it has far more specific embroidery features. The SE400 has lots of font options for monogramming, and computer compatibility for infinite embroidery. The downside is that it’s limited to a 4”x4” frame size, and built quite lightly. If you want to work on larger embroidery pieces, you ought to look at the more expensive Designio. And unless you’re only going to do fairly light pieces of all-purpose work, you may want to use this alongside a sturdier, simpler model. The Brother Designio is our top quality pick for most embroiderers. It’s by far the best-equipped of the three models for fine needlework. There are hundreds of designs for you to work on right out of the box, and you can choose between three different frame sizes. Plus, you get all the convenient features and computer capability that we love on the cheaper Brother’s. The biggest downside of the Designio is the high price tag. This would be expensive enough for most people as an all-purpose machine. Given that it’s only for embroidery, monogramming, and trim work, it looks even pricier. We don’t recommend it to people who only embroider on occasion. It’s for dedicated craftspeople who will get their money’s worth out of it! Will this be your primary machine? The first is to buy an all-purpose sewing machine that has specific embroidery and monogramming features built in. If you grab one of these models, you can do your fancy finish work on your primary machine. If you’re not an intense user who works with lots of thick materials and on big projects, you can do very well with one of these machines as your only workstation. We think going for a versatile all-in-one is the best choice for most casual users. It’s also a good financial decision for thriftier folks. If you’re a more regular needleworker, and put a lot of yardage on your sewing machine, you should think about the second approach. That is to say, you should consider getting a specific embroidery and monogramming machine. If you buy one of these machines, you’ll have to have another sewing machine as your all-purpose workstation. This is no bad thing, since many all-in-ones with embroidery features tend to be lightly built. They aren’t the best choice for daily use, especially if you’re a serious quilter or work on projects that involve layered denim. If you have separate machines, you can have a rugged workhorse for construction and quilting, and an embroidery/monogramming machine for finish pieces. The key reason we don’t recommend that advanced-level users or folks with a flexible budget buy an all-in-one for both embroidery and daily projects is reliability. Embroidery-centric all-in-one’s have computers which aren’t very reliable. On the whole, these machines are elaborate, but not rugged. They usually have plastic gears and inner workings. Most all-in-one’s with embroidery features aren’t actually intended as workhorses. Many people choose to have one primary sewing machine, and then one machine for embroidery and monogramming. There are all-in-one’s with embroidery features that don’t have light, delicate build quality. However, they cost thousands of dollars, which makes them inaccessible for anyone who doesn’t make their living from needlework. So, if you’re not a heavy user and don’t put much strain on your sewing machine, an all-in-one with embroidery functions could serve all your needs well. If you’re an advanced needleworker with ambitious projects in mind, you should probably go the route of having two machines. Do you want to be able to add custom or downloaded designs? All sewing machines that do embroidery have computers onboard. They’ll have a number of preset patterns from the factory, which you can use for your projects. If you want to go beyond the presets and find something more unique, you should spend a bit more for a model with computer connectivity. If you can connect your sewing machine to a computer or USB drive, you can easily use one of thousands of embroidery patterns available online. There are collections available for sale, as well as plenty of free options. As long as the design you use is formatted as a .pes style, you can use it in just about any embroidery machine! Having this capability allows you to broaden your options for embroidery, and even come up with your own designs! It’ll cost you extra, though. Figure out how much money you want to put into your new embroidery and monogramming machine. In general, the more you spend on a sewing machine, the better quality you can expect. That’s true in nearly every category. However, we’ve found that it’s not necessarily true with embroidery machines. Even some of the $3000’s can have problems, just like the much cheaper Brother’s we’ve recommended in this guide. That’s why we’ve kept our range of recommendations on the smaller end of the price spectrum. We think that if you’re going to deal with the kind of spotty quality control and finicky computer systems that are common with embroidery machine, you shouldn’t be taking chances with thousands of dollars. So, we recommend that new needleworkers and those on a budget spend about $150-$300. Intermediate and advanced needleworkers should plan to spend between $300 and $800. Even professionals shouldn’t be spending more than $1500, since we don’t think you get a vast improvement in reliability. If you don’t have any limit to how much you can spend, we do think Janome’s Memory Craft lineup are very good for embroidery and monogramming. They can also handle your all-purpose work. Given the price tags of close to $5K for most of them, though, we don’t think their realistic to recommend to most people. How large of pieces do you want to create? Finally, the size of the workspace on any sewing machine will inevitably dictate the size of the projects you take on. That’s especially true of embroidery. While you can work on quilts in chunks without too much trouble, fine finish work like embroidery really needs to be done all in one piece. So, you should think about how large of patterns you’re interested in making. Many machines will only accommodate a frame up to 4”x4”. Or, they’ll allow for you to use a larger frame that can be moved around to different positions to finish a larger piece. If you’re interested in working on a scale larger than 4”x4”, though, you should really invest in a machine with more dedicated workspace. You can find out more about any of our recommendations and see pertinent details like current prices and specs by clicking on the links in our reviews. If you’re still on the hunt for the ideal embroidery machine, you might consider having a look at the Janome Memory Craft line. We’ve featured one in our best-of picks, so head over to our homepage to see the review.